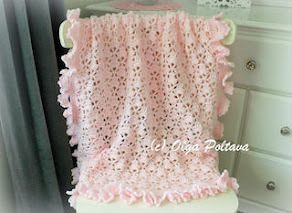 This baby blanket is simple and quick to make. The clusters texture is soft and airy. 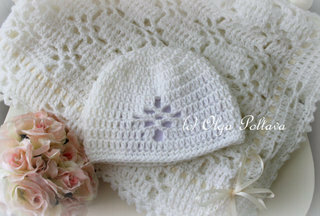 This could be a lovely baby shower or newborn shower gift. 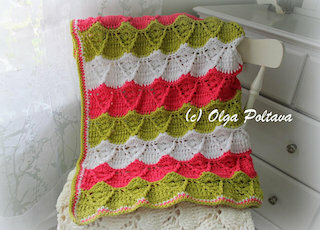 I made this blanket in a small size, approximately 32 by 27 inches. 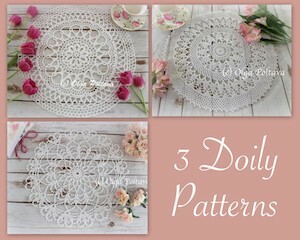 But the pattern can easily be adjusted for a bigger size. 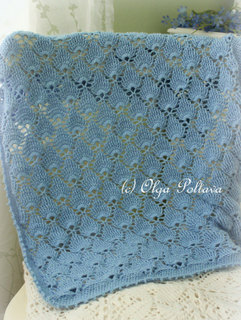 I used about 750 yards of Bernat Softee Baby, and size G/6 (4.25 mm) hook. Here's a simple pattern to make a necklace or just a decorative cord that can be used for other projects. *sl st in next 4 ch, ch 3, sl st in 2nd ch from hook, sl st in next ch (leaf made), sl st in each ch to next leaf, skip leaf* three times, sl st in each ch to end of ch. Fasten off. Tie the thread tails and secure with a bit of clear glue or clear nail polish. Once dry, trim off the threat tails. Make the second piece same way. Pass the ends through a big bead or two. Tie the other two ends into a knot. Use a bit of clear glue or clear nail polish to secure the end. 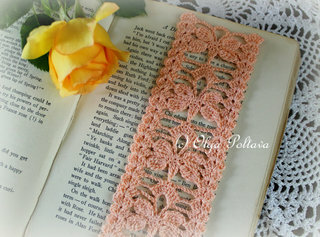 Here is another bookmark that was inspired by the blooms in my yard! I love lavender! I keep a small sachet filled with dry lavender in my socks drawer. I also use lavender oil for a body scrub that I make myself. I used to buy sea salt scrubs, but now I make them myself (at a much lower cost). I simply mix together fine grain sea salt and organic coconut oil (in about equal proportions), and ad a drop of lavender oil . But back to my bookmark. It's a simple pattern. 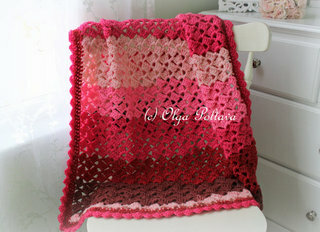 I used size 1.25 mm crochet steel hook and a small amount of crochet cotton thread size ten. 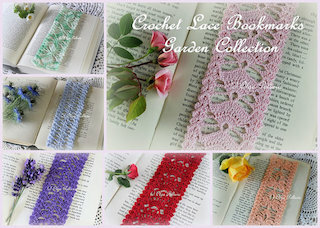 I now have a collection of five lace bookmarks in different spring colors. Yesterday I celebrated my birthday! It was a memorable and happy day for me. Here are a few highlights from my special day. For my birthday outfit I chose to wear this white lace crochet cardigan. My mom purchased it for me from a thrift store a couple of years ago. It was in perfect condition and only cost five dollars. I don't wear it often as it's one of the most dressy items in my closet, a special occasion kind of thing. But on my birthday, I paired it with jeans as I wanted my outfit to be special, yet comfortable and not too formal. 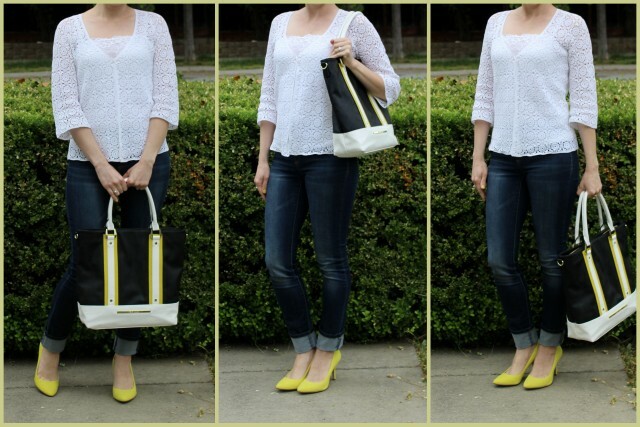 My bright lime green shoes (which somehow look yellow in these photos) and a bag with the same lime green accents added a splash of spring color to my outfit. 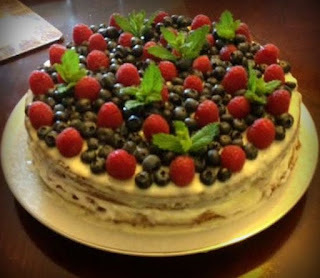 This year I decided to bake my own birthday cake. I noticed that lately the bakery cakes taste way too sweet for me, and I usually avoid sweet treats altogether. For my special day, I wanted a cake entirely to my liking. I cut the sugar in the original recipe in half. But I compensated for the sweet taste with lots of raspberries and blueberries. Everyone in my family liked the cake. Even my dad, who doesn't give out praise easily, complemented my baking. I snapped this photo with my phone, so it's not of a good quality. I forgot to take a better picture later one. I received lots of warm wishes and wonderful presents on my special day. 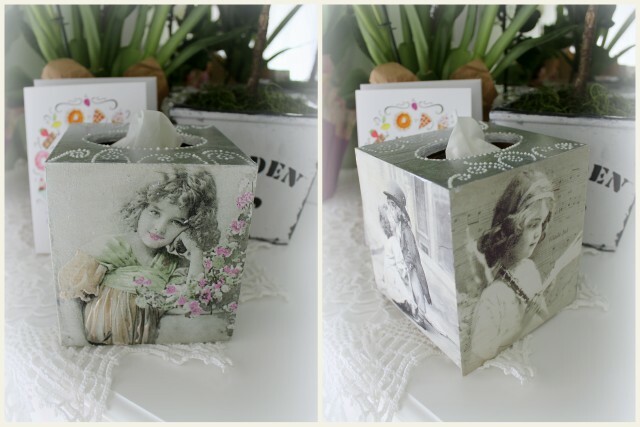 I got fresh cut flowers, potted tulips, which I'm going to replant in my garden, a gorgeous orchid (I hope I'll be able to take a good care of it), a lovely bonsai lemon cypress tree, which smells incredible, and a beautiful hand-crafted tissue box cover. My dear friend Valentina decoupaged it for me. Such a beautiful and delicate work. It had been a wonderful birthday! My family and friends made me feel truly special. After crocheting, my greatest hobby is gardening. I always get very excited whenever a new bloom comes out in my tiny garden. I also grow my own vegetables and herbs. A few years ago, at a local park I collected seeds from the wild-growing Blue Nigella flowers. I scattered them in my front yard the following spring, and I got abundant blooms. Here are a couple of pictures from that year. The next year, the flowers reseeded themselves, and again I had some beautiful blooms. I still get my Blue Nigella every spring, but they are not as abundant. I think I'll need to collect some seeds again. I was inspired by my Blue Nigella to make a blue bookmark. 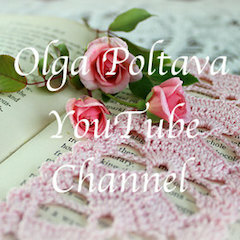 It's similar to the other three bookmarks I've made this spring. 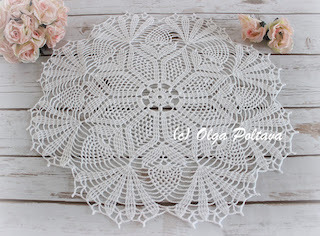 Just a simple lace rectangle. 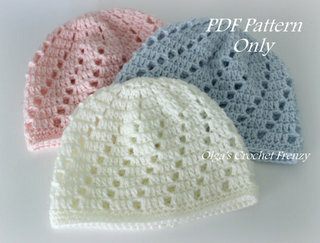 The pattern is available in my Etsy and Craftsy shops. Thank you for your support. 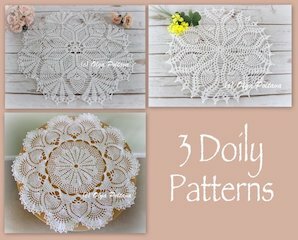 I made this doily following a vintage pattern from Pineapple Pageant Book No. 252 by the Spool Cotton Company, 1948. I'm trying to use up every small amount of yarn and thread that I have. 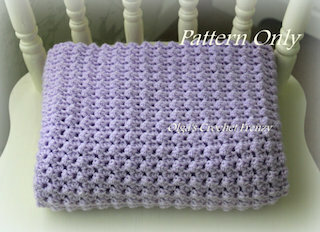 So I used leftover dark purple crochet cotton thread size ten. 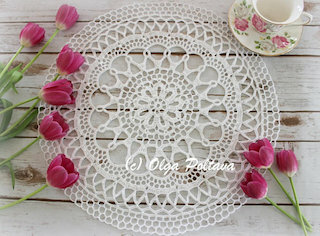 Unfortunately I didn't have enough, so I finished my doily with a lilac color thread. 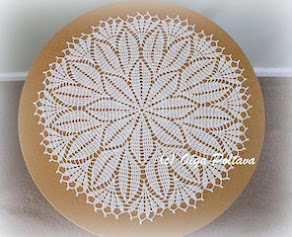 My doily measures 10 inches in diameter. I used 1.25 mm hook. The flowers in these photos are from my Yesterday, Today and Tomorrow shrub (Brunfelsia Pauciflora), which is in full bloom right now. The flowers start dark purple, then change color to lilac, and eventually white, resulting in a beautiful display of flowers in three colors. 1st rnd: Ch 3, 23 dc in ring. Sl st in top of ch-3. 2nd rnd: Ch 6, holding back on hook the last loop of each tr tr make tr tr in next 2 dc, thread over and draw through all loops on hook (cluster made), * ch 9, sc in 5th ch from hook (picot made), ch 4, make a 3-tr tr cluster over next 3 dc. Repeat from * around. Join last ch-4 with sl st to tip of first cluster. 3rd rnd: Sl st to center of next picot, in same picot make sc, ch 7 and sc; * ch 4, picot, ch 4, in next picot make sc, ch 7 and sc. Repeat from * around, ending with ch 4, sl st in first sc. 4th rnd: Sl st in next 3 ch, sl st in same loop, ch 3, in same loop make dc, ch 2 and 2 dc (shell made); * ch 5, in next picot make 2 dc, ch 2 and 2 dc (another shell made); ch 5, shell in next ch-7 loop. Repeat from * around. Join. 5th rnd: Sl st in next dc and in next sp, ch 3, in same sp make dc, ch 2 and 2 dc (shell made over shell); * ch 4, in sp of next shell make (dc, ch 2) 4 times and dc; ch 4, shell over next shell. Repeat from * around. Join. 6th rnd: * Make shell over shell as before, ch 5, 5 dc in next ch-2 sp, drop loop from hook, insert hook in first dc of the 5-dc group and draw dropped loop through (pc st made); (ch 2, make a pc st in next ch-2 sp) 3 times; ch 5. Repeat from * around. Join. 7th rnd: Sl st in next dc and in next sp, ch 3, in same sp make dc, ch 2 and 2 dc; * ch 5, make a pc st in next ch-2 sp, (ch 2, pc st in next ch-2 sp) twice; ch 5, in sp of next shell make (2 dc, ch 2) twice and 2 dc. Repeat from * around. Join. 8th rnd: Sl st in next dc and in sp, ch 3 and complete a shell in same sp, * ch 5, make a pc st in next ch-2 sp, ch 2, pc st in next ch-2 sp, (ch 5, shell in next ch-2 sp) twice. Repeat from * around. Join. 9th rnd: * Shell over shell, ch 5, sc in ch-2 sp between pc sts, ch 5, shell over shell, ch 5, sc in next loop, ch 5. Repeat from * around. Join. 10th rnd: * Shell over shell, ch 5, sc in next sc, ch 5, shell over shell, (ch 5, sc in next loop) twice; ch 5. Repeat from * around. Join. 11th rnd: * Shell over shell, ch 2, shell over shell, (ch 6, sc in next loop) 3 times; ch 6. Repeat from * around. Join. 12th rnd: Sl st in next dc and in sp, sc in same sp, * shell in next sp (between shells), sc in sp of next shell, (ch 7, sc in next loop) 4 times; ch 7, sc in sp of next shell. Repeat from * around, ending with ch 3, tr in first sc. 13th rnd: * Ch 8, sc in 5th ch from hook (picot made), ch 3, sc in next ch-7 loop. Repeat from * around, ending with ch 3, sl st in tr. 14th rnd: Sl st to center of next picot, sc in same picot, * ch 5, picot, ch 5, sc in next picot. Repeat from * around. Join and break off. Starch lightly and press.